Despite Shimano making both cable and hydraulic disc brakes for road and cyclo-cross bikes they've still got room for a cantilever brake in their stopping arsenal. The CX70 brake is their Ultegra-level cantilever and it comes in a fetching pewter that matches the rest of the Ultegra groupset so your bike can look all smart. The CX70 comes as a front or rear brake. They look exactly the same and closer inspection reveals they are, except that the open end of the pad holder is different. They will win fans straight out of the box because they're pretty easy to set up, only needing a couple of allen keys and a screwdriver compared to the multitude of tools and three hands that some other 'performance' cantilevers require to fit to a bike. The only thing that takes a little while is fiddling with some hourglass shaped spacers so the brakes fit your bike's specific distance between the brake posts and rim width combination. In a feature that's a departure from the norm the CX 70s come with a collection of different length spacers that fit between the pad and brake body. 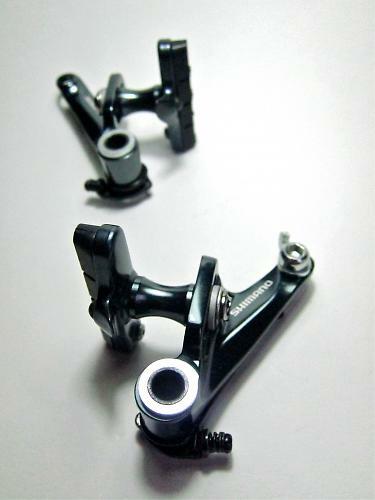 These come in three different lengths so the brake arms always end up at whatever Shimano have decided is the right angle for maximum mechanical efficiency and the pads hit the rim square. The instructions come with a simple chart for this procedure making initial set-up take a little longer but it's worth the little bit of faff. There's a useful 20mm of vertical brake pad height adjustment. The CX70 lies halfway between a sticky-outey Froggleg style brake and a low profile stopper, so you shouldn't have any problems with heel strikes or pannier fouling should your cantilevers be on a hauling bike. 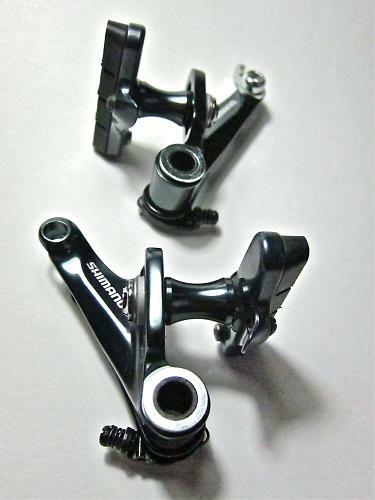 Ignoring Shimano's recommendation and swapping spacers around would fix that though. 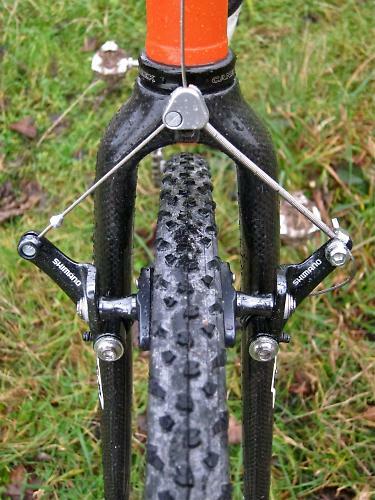 The CX 70's come with a Shimano cable carrier which gives a set straddle angle. If you're an incessant brake tinkerer and suffer the need to minutely adjust the height of your straddle wire to get the right feel to your stopping, you might be tempted to throw these away like you always do and fit a proper straddle wire and cable yoke but there really is no need. I thought I'd be removing the carrier cable, because I pretty much always do, but the Shimano system has stayed on. Combined with their canti spacer system the Big S appear to have done their sums right and the CX70s have a lovely firm and positive feel right out the box. As the cable yoke remains static with no side to side adjustment both brake arms have a spring tension adjustment. The CX70 cantis use road sized brake pads which has the twin benefits of making it easy to get replacements or to change the stock pads to suit your posh carbon rims. Being shorter than the V-brake pads that some other cantilevers use means the arms can spring open further as the stumpier pads will clear fork arms and chainstays. That makes it easier to remove wheels, especially fatter tyred ones. Enough of the fixtures and fittings, you want to know if they work. Yes, yes they do. Plain, old fashioned, simple, no fuss work. You know that thing that Shimano are good at where stuff just works and you don't have to think about it. They do that. The braking power they offer is both reliably powerful and predictable. They're not grabby and neither does their braking fade should you pull on the levers for a long period of time. The CX70s aren't quite as powerful as some brakes that cost a whole wallet more, but they're better than brakes the same price and far superior to cheaper brakes. In the dry they're as good as a disc brake and in the wet their performance does drop as you'd expect with a rim full of water and mud, but not as much as you might expect, and even then braking was boringly reasonable and steadfastly unfrightening. On top of all this they don't rattle on the posts and they don't squeal either and they're easy to adjust when wear or replacement of pads demands. They're solid, reliable and just work. Monotonously. The only niggle I had with them was that it could be fiddly to unhook the fixed cable-end from the brake arm at times, especially with cold hands on a windblown hillside, but that's the only bad thing I can say about them. If you think £100 a bike is a bit spendy for some old-fashioned rim brakes then the CX50 brakes, which are mechanically the same but less delicately refined are £40 a bike cheaper. 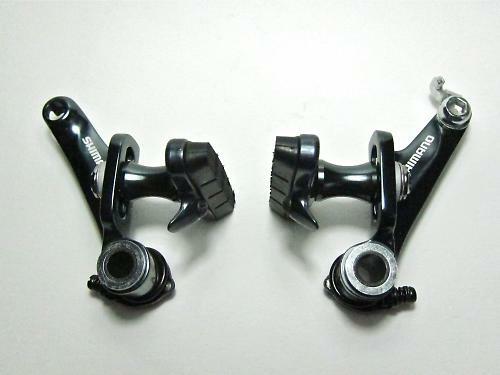 The Shimano CX70 is a cantilever brake designed to work with road levers, specifically STI levers, not V-brake levers. They're ideally suited to cyclo-cross offering good mud clearance yet still maintaining a low profile and can be used for CX, touring, Audax and flat handlebar road bikes with wide tyres. 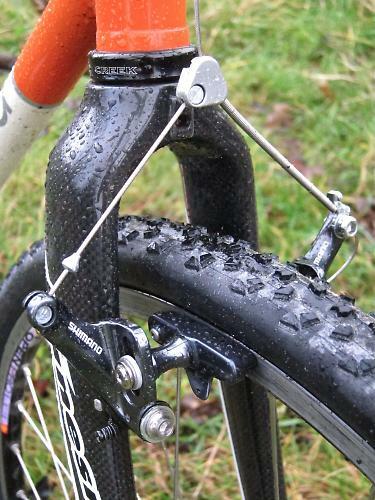 Easy set-up and adjustment with cartridge brake pad holders. Forged construction, designed for use with Shimano's 105, Ultegra, Dura-Ace and Di2 brake levers. Semi low-profile design, cartridge brake pads. A cantilever brake could almost be seen as obsolete technology now but there are still a lot of people that need a rim brake. These did that job admirably, simple to work on and more than adequate braking all of the time. I've ridden road disc-brakes that have been more trouble. The ease of fit and fiddle, and the predictable, reliable braking. Nothing at all apart from the straddle wire being a pain to undo sometimes.